3 Days 2 Nights tour Yogyakarta, Best Yogyakarta tour Package – Yogyakarta 3 Days 2 Nights is best choice for your weekend gateway. The tour will give you whole family entertained, we will bring you to see amazing culture, nature and tradition in Yogyakarta. Our crew will pick up you at Yogyakarta airport, then we start our journey to sultan palace, sultan palace a.k.a Kraton Yogyakarta is the javanese culture living museum. The palace is the main living area of Sultan of Yogyakarta and his family. It became a cultural center for the Javanese people and include a museum that displays the sultan’s goods. From sultan palace continue our trip to Tamansari water castle, this places is the site of a former royal garden of the Sultanate of Yogyakarta. It is located about 2 km south within the grounds of the sultan palace. Built in the mid-18th century, the Taman Sari had multiple functions, such as a resting area, a workshop, a meditation area, a defense area, and a hiding place. After lunch break, we continue to visit Prambanan temple. Prambanan is the Hindu counterpart of Borobudur built by the 10th century Mataram Kingdom, a mighty empire covering a large part of Indonesia. The remains of a complex of a dozen candis spread over the Prambanan Plain still exist but the focus of restoration has been on the central complex originally fortified by a series of walled enclosures containing 232 temples. From prambanan temple, we check in hotel and free program. Depart at 7 AM from hotel, we will drive to southeast Yogyakarta where is the located of Jomblang cave, will take about 2 hours. When we arrived, we prepare to descend the hole, installing an equipment to your body. Our cave instructor will help you. If all ready then we Descend the Jomblang hole with human belay system, an easy system for beginner (training is not necessary). Cave instructor will dropping you down slowly to the base of the hole, 40 meters vertically, with a rope attached to your body. Then continue dry trekking into the other hole, Grubug cave. Light is necessary here. Nearly to Grubug hole, you will hear the rustling of underground river. Eventually the light was beginning to look and finally, the ray of light is coming down from the hole above us. We have arrived at Grubug hole, 80 meters above us. 20 meters below us is the underground river. The first sight is a thousand light falling on the flowstone (cave ornament), the ray of light. Nice moment for photograph. But remember, don’t stand on this rock. After that we have lunch break, after lunch we continue our adventure to Timang beach to see gondola. If you want try crossing to Timang island by gondola you must pay IDR 200.000/ Person. Timang island is a small island. You have to across ocean to get there. It is adrenaline challenge and best experience in whole your life. Usually fisherman cross to the island to catch lobster using a trap. Sometimes it become favorite place for fishing. But, to get here you have to collect all your courage to across the ocean. This place quiet isolated, not much tourist visit here cause the way so rocky. Even, for local tourist. 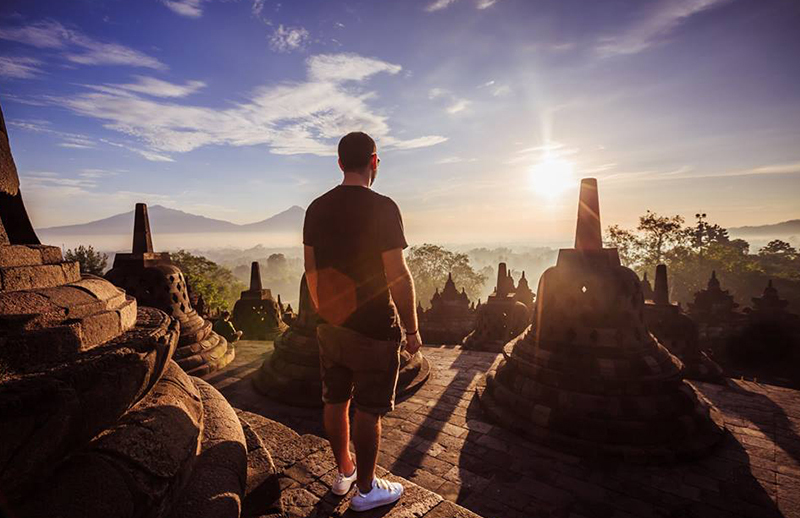 Day 3: Borobudur sunrise – Merapi Lava Tour – Yogyakarta airport. Earling morning around 4 AM, we will take you to explore the Borobudur Temple and see the sunrise from the top of the temple. Marvel at the magical light cast over this UNESCO World Heritage Site. After that we have break for breakfast and shower, then we continue our trip to Kaliadem village. Arrive in Kaliadem village we take 4 WD jeep for Merapi lava tour, In merapi lava tour we will see the several village that were affected by Merapi eruption at 2010. You will also get to see authentic and real village life, where people carry their loads on their back while at work. Experience a variety of tropical plants and fruits, birds, giant spider, unique vegetables and beautiful landscape in the cool mountain air. After Merapi lava tour we will drop you to Yogyakarta (hotel/ airport). End of service.